I am very happy that you came back to the work after the hurricane and I am able to communicate with you and to receive your letters. The first of all I would like to inform you that Today I come back from Poland. Today I defended my master thesis and was admitted to study PHD program in Poland. I will study by computer from Ukraine and will need from time to time to come to Poland to take my exams. 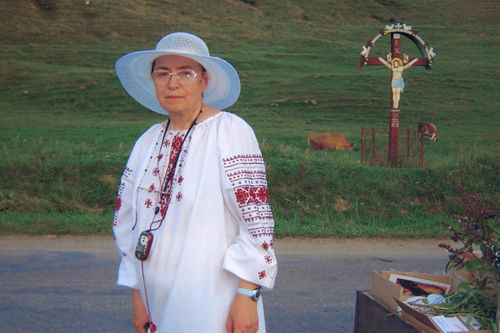 It gives me the possibility to stay in Lviv and work for the Living Rosary full time and I will be able to continue my work without any problems for four years. 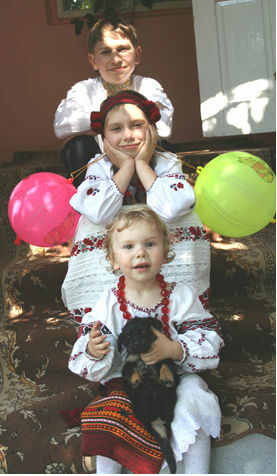 Today I come back to Ukraine to work for the Living Rosary. Also I have very good news. 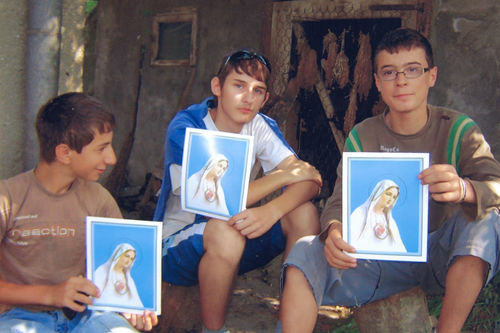 Our missionary center is going to publish the Novena to Virgin Mary from Lourdes. Also in this book was put information about the Living Rosary Association and how to enroll to ULRA and information about our devotion. Therefore I hope that more new people will join our organization. Also this is very tremendous news. 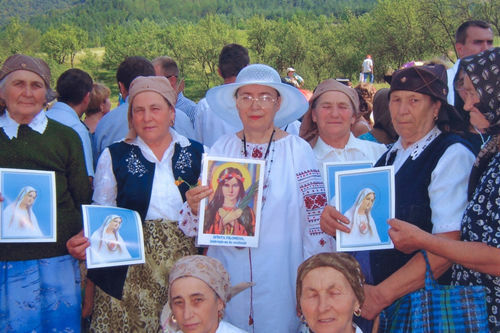 One of the most important bishops from Ukraine asked the ULRA to publish his reflections upon the Rosary. He is very smart bishop and good preacher. His reflections are very traditional and many people ask us to publish this book I think it will be very good idea to publish this book. At the end of the book I am going to add the information about our organization and mission. Recently I met with the bishop Sofron Mudriy and he told me that he gives official permission to publish this book and he thanks the Living Rosary Association and you for our work and sacrifice. 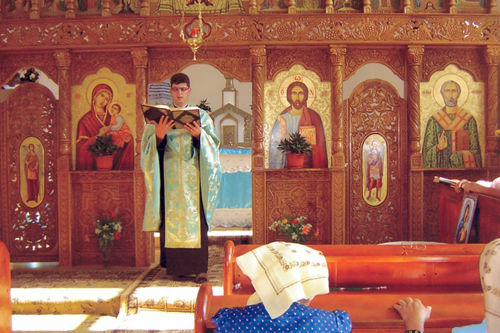 I think it is very important step which will help us to extend our mission and get the recognition from the bishops of Ukrainian Greek - Catholic Church. What do you think? Please let me know but I ask your permission for publishing this book and Novena to Virgin Mary from Lourdes. I ask you the official permission and will wait until you will let me know. More new members are enrolled and I am going to send you more pictures and new members list this week. Dear Mrs. Patti This month we will need to increase the copies of the newspaper for 10,000 because more people are willing to receive the newspaper and more people enroll to Living Rosary Association by reading of our newspaper. I thank you very much and May God Bless you. All the Sacred Masses are arranged and I am going to send the notes tomorrow morning to you via - regular post mail. I am looking forward to hear from you and May God bless you. How are you? I hope everything might have been restored and put into function after your terrible Hurricane. But still I am worried as I have not received any note from you. Can you please write a few lines? I want to tell you today about my visit to Hasilpur (about eight hours travel from faisalabad). I went there on 25th in the morning and reached there at about 7:00 p.m. On 26th Bishop Andrew Francis (Bishop of Multan Diocese) also came there. He offered Holy Mass. Fr. Francis was there from Larkana for lecture. You might have heard about the series of bomb blasts in Pakistan. Almost everyday, there is a blast somewhere in Pakistan. Even in Islamabad (Capital city of Pakistan) is not safe where last days Marriot hotel has been ruined taking lives of many including some foreigners and Pakistanis. So, likewise while Bishop was giving thanks after Mass, news were heard about a blast in Hasilpur. Fr. Asif the parish priest immediately tightened security. When the news came on media my daughter and my mother contacted me and asked me if I was safe. They all were very worried. At night, before I returned back we went to the site. It was just five minutes distance from the Church. The bomb had been placed on the railway line which blasted while train was passing over it. So, this is the condition here. It is very dangerous these days to travel, no body knows what will happen where the bomb is; in the bus, train, van, hotel or bus stand railway station etc. Therefore please always keep me especially in your prayers. 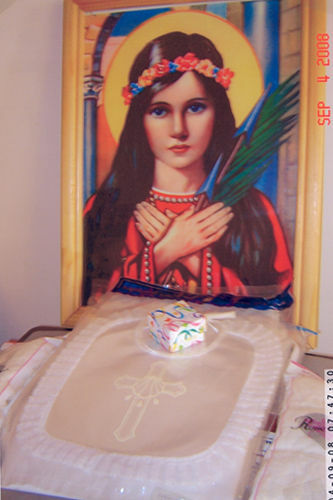 After waiting a lot, I have ordered to print banners of St. Philomena. Because I am going to Jhelum on Wednesday and Sr. Iffat asked me to bring it. Then I will go to Mianwali, Sialkot and Nowshera. I think I will cancel the Nowshera because it is in N.W.F. Province and there the security condition is very worse. Please send two airlifts as soon as you can. I am sending you some new lists and pictures. 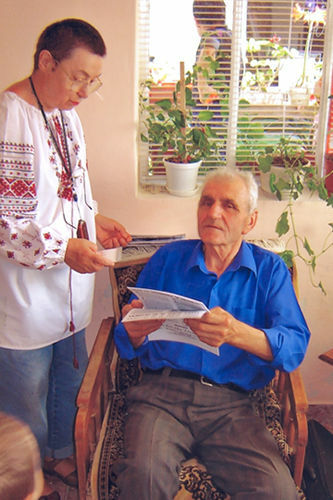 Sr. Mateiya is the local leader of the Living Rosary in Dolyna City and enrolled many new members. 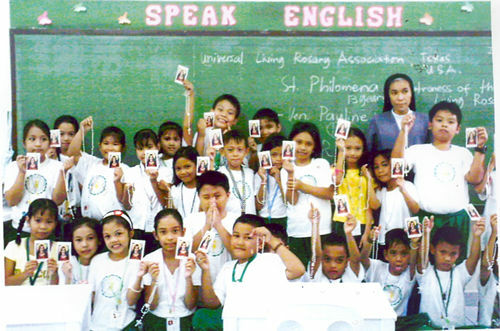 These children belong to Saint Philomena. They pray very often to her. 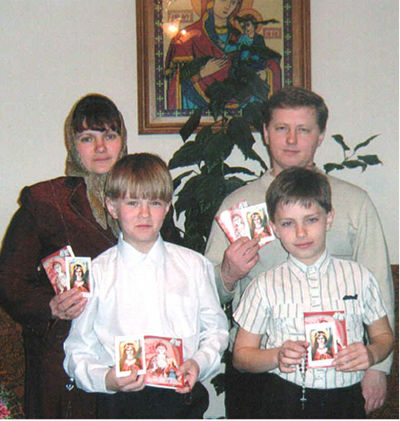 This family was saved from a divorce by Saint Philomena. They became very devoted to the Living Rosary and Saint Philomena as they received many graces. Nick is helping me very much to make the parcels. He takes pills to support this hot summer. 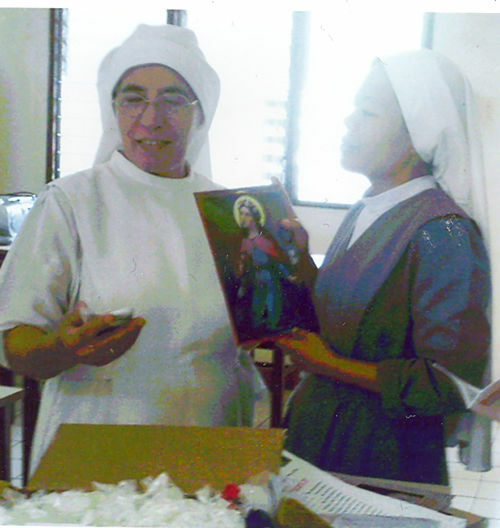 Sister Ana and Sister Speranta help her not only with prayers but also spreading the Saint Philomena devotion. We visit the homeless to give them encouragement and sometimes offer a little food. Thank you Saint Philomena. Then Nick is coming with me to the post office to send them to Transylvania, about 500 Km from here. 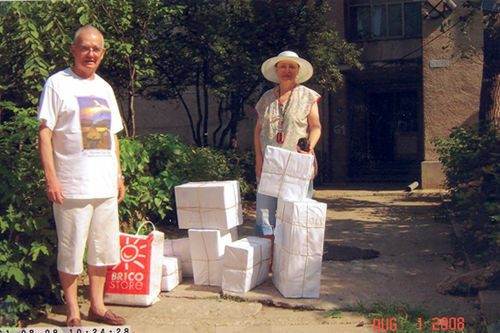 Nick also brings the boxes from the railway station post office. Always walking because we do not have a car. Father Monoses receiving from the Universal Living Rosary Association of Saint Philomena many presents because he has a big parish. Cloths for the divine service, cloths for the little girls to welcome the Bishop at the festivities, ULRA materials, etc. "Thank you dear ULRA for all. God Bless you always together with all the ULRA family." Father Monoses receiving a case for sick people. 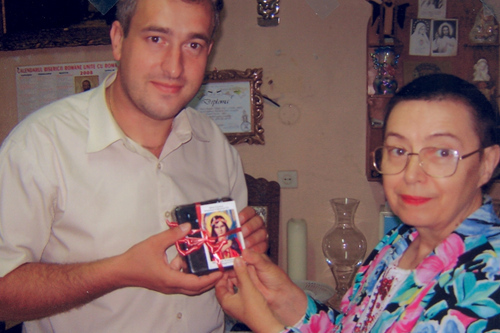 He is very glad for this present from Saint Philomena. Many priests need such a case for the sick of the parish (with candles and holy water near a Crucifix). 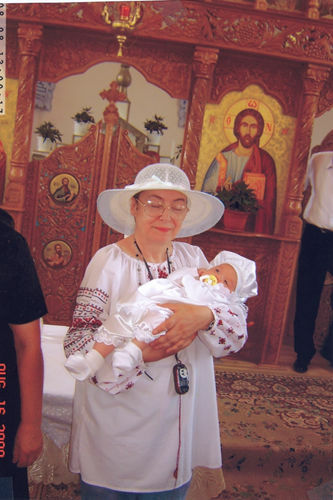 Sister Irina is happy to spread the Saint Philomena devotion at the monastery. St. Philomena visited the sick people giving them hope at the hospitol. In the middle is a young pregnant lady. 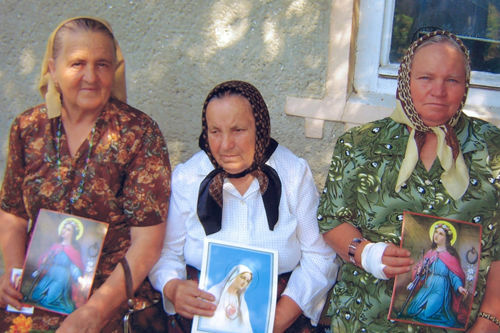 She humbled herself in asking for an extra Scapular for her daughter which will come soon. 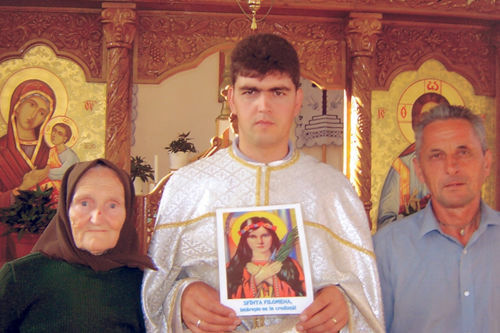 The men found for the first time about St. Philomena. They need to know more. They need more. They need me to visit them more often and to bring those leaflets and icons. 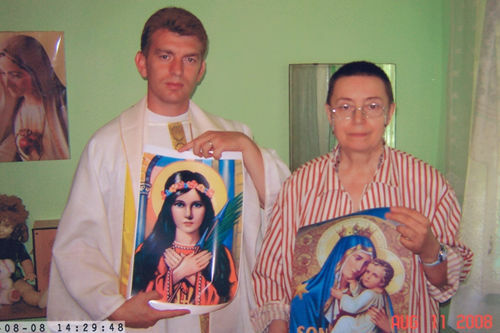 Father Mihut Lucian is always ready to spread the devotion of Saint Philomena. 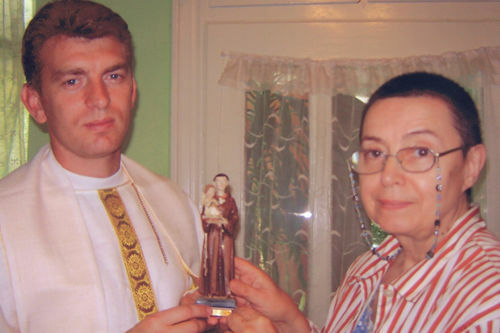 A statue of Saint Anthony is a present from Ruth, our dear ULRA promoter in United Kingdom. Father Lucian thanks very much to ULRA for collaboration to help Romania. Together with another priest colleague, he is praying for the benefactors and all their families. 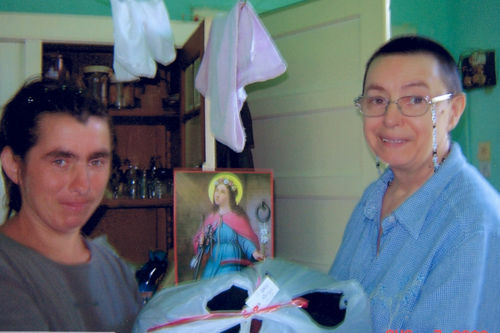 Saint Philomena sent some clothes to the poor. Angelica is very glad for these clothes. 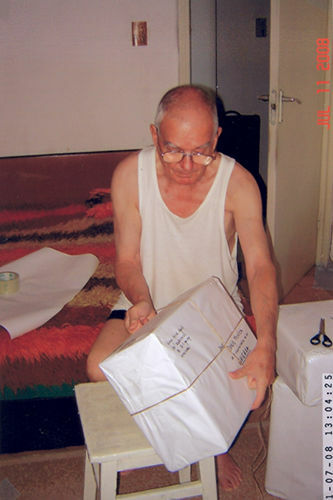 Father Mihut receiving a box of ULRA material. He promotes all he can find in this treasure box. Thank you dear ULRA sisters and brothers. God Bless you all. 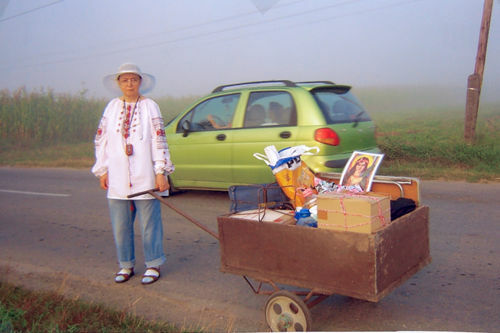 Traveling at Nicula to spread the devotions during the fifteenth of August Pilgrimage. My helper Francisc and me. We started to travel on the fourteenth of August to see the situation of this village. It was a foggy day. 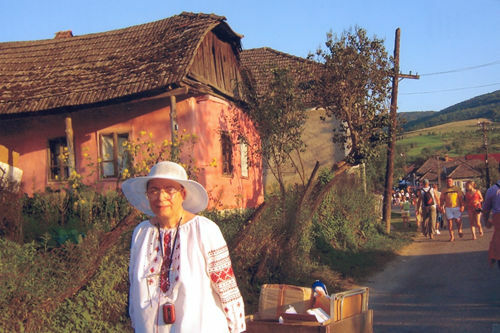 We had to walk about 8-9 Km from Gherla city to Nicula village. It was very difficult without a car. Without a horse card or something. So, we borrowed a push-cart to transport all our ULRA material. In our way to Nicula we were overtaken by many cars. Each of them giving off a lot of smoke until we had pains in our throat and chest. I had also headache because of too much smoke. If could have a little car we would be very happy and much more efficient. 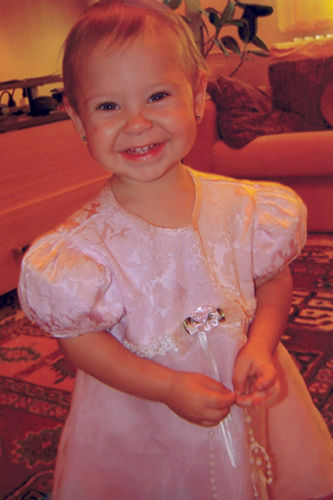 We pray to our dear little Princess Philomena to help us with a car to better serve Our Lady and Jesus. When I had headed back, I asked Francisk to continue to draw the push-cart in my place. But he is very sick. 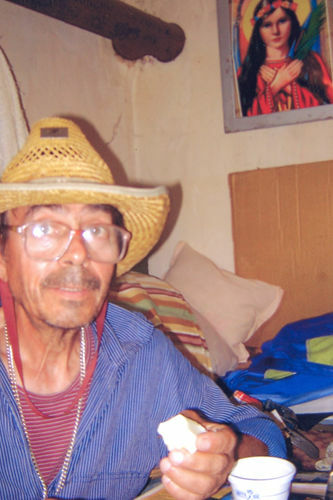 He was operated on having surgery on a part of his large intestine which was removed. So, after few minutes he could no more help me draw the push-cart. I continued to do this humbling work. Many were laughing at me because I am doing the work of a farm horse. So I offered to Our Lady this humiliation too. More ULRA groups of young girls and boys were registered at Nicula. Especially the youth asked for more ULRA material. 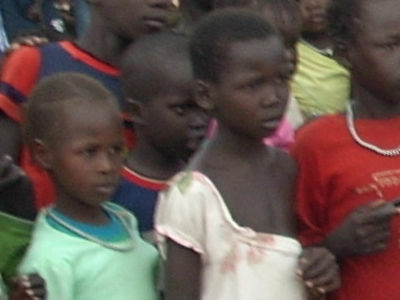 More groups of young girls and boys appeared at Nicula. These youth need more materials. Unfortunately I had no more little Rosaries to deliver. But we ask Saint Philomena to help for the next time. 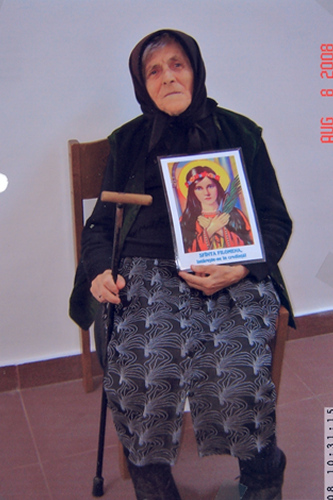 Because our churches are still confiscated, Aunt Livia offered her little house as a Parochial House at Nicula. Thank you dear ULRA for all you sent to us. God Bless you! 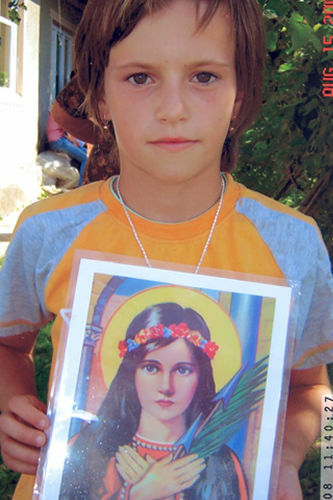 Young girl very happy to meet Saint Philomena. 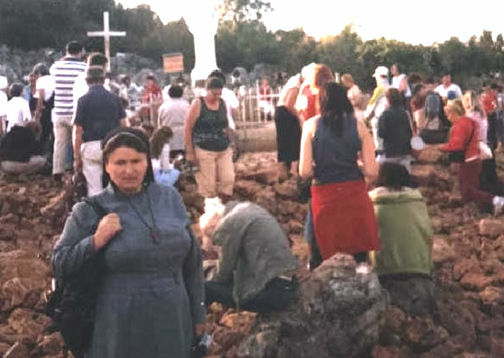 From the little hill situated immediately in the back of the church, we could see some of the priests confessing people in free air, where they could, because our large Nicula Church is still confiscated (after eighteen years from the revolution). New groups of the Living Rosary Association were registered this day. 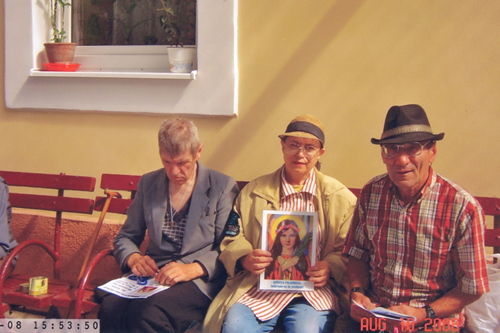 The people from villages are happy to meet Saint Philomena at Nicula. They wanted almost all of them to bring our Little Princess in their houses. Than, you ULRA for all you sent to us including your Apostles. 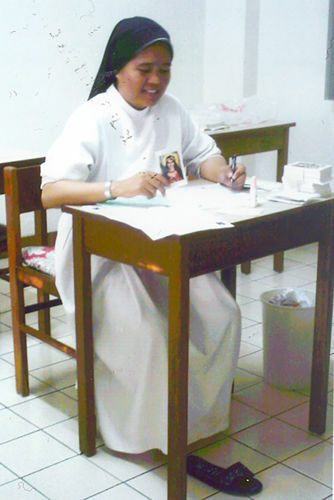 After the Holy Mass, a woman got sick. She needed medical help. 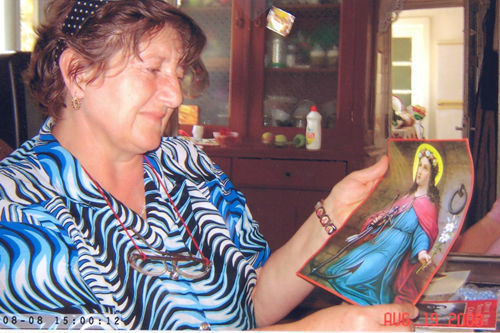 Trusting in the help of Saint Philomena I asked a police agent to help this woman. He was very polite and was coming immediately with a little sugar and water. The result was good. This woman started to become in good condition. God Bless this police agent. He was a good man. 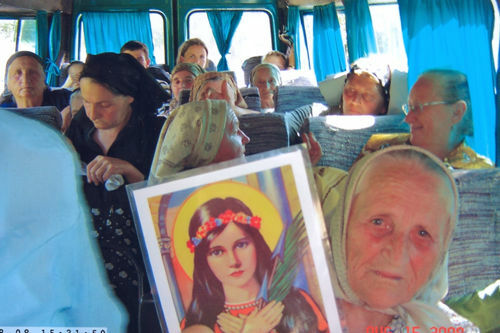 Saint Philomena traveled in the bus from Nicula to Tihau where the parish of Father Ioan Puie is located. We could not go by bus because we had the push-cart with ULRA material to take care of. We shared more materials to all who needed. At a moment a car was coming too close by our cart. A stone hit a wheel and I was obliged to pay for this damage. 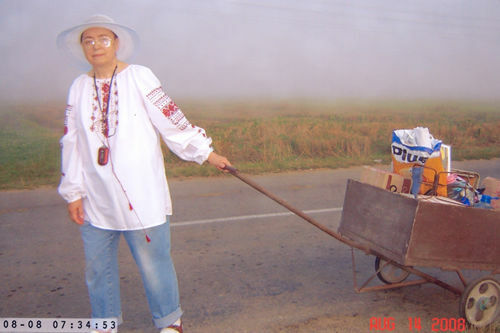 The lady who borrowed the cart for me will never give to anybody again. I’m sorry but it can happen anytime. The day ended in this way. 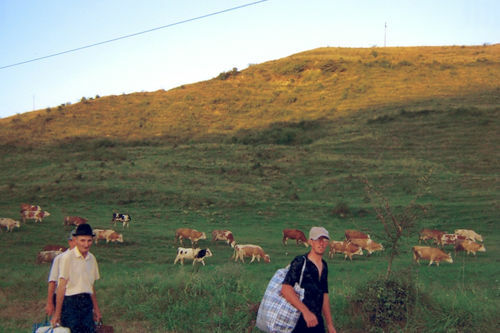 The sun was going down, the cows returned home and Francisc together with Monica were going back to Gherla walking again many Kilometers, in the smoke of the cars. At each Crucifix in our way, we invoked the Divine Mercy to help us in our activity to spread the Faith. Because it’s for the Greater Glory of Our Lord. The microbus to Tihau Village was prepared. 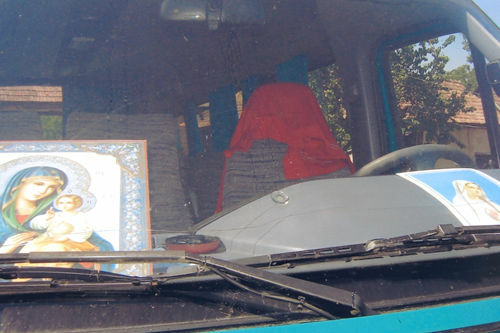 The Our Lady image was in front of the bus for protection. 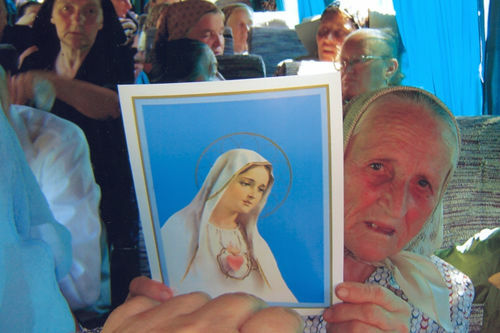 People in bus were very glad to have the Our Lady images. Father Ioan Puie at the Altar reading for us during the mass. 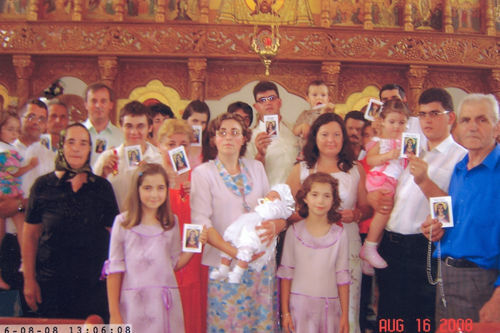 The next day was a special event for all Transylvania: it was the baptizing of the first Filomena in our country. 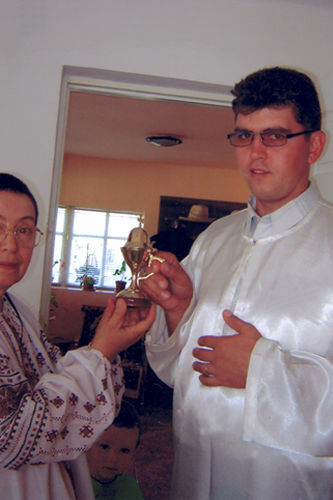 Father Puie Ioan caring the precious baby in front of the Altar. 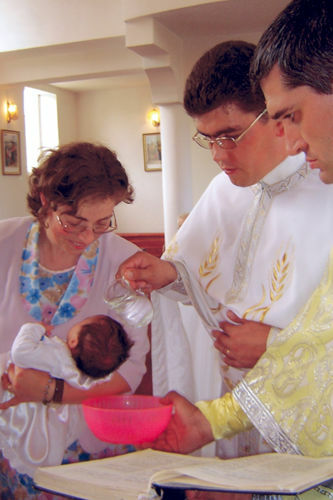 Father Hoza and Father Radu Puie christening the little Maria Filomena. 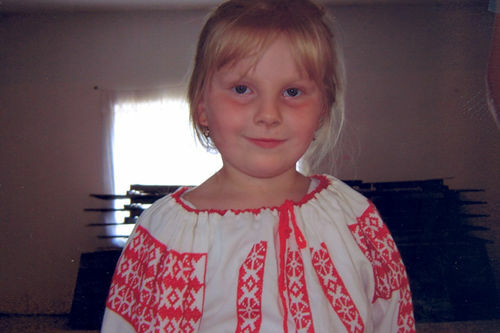 Maria Sutherland, another ULRA member from the U.S., inspired by Saint Philomena sent also a very beautiful baptismal garment for the little Filomena in Romania. Thank you Marie. God reward you abundantly! Monica together with the little Maria Filomena. 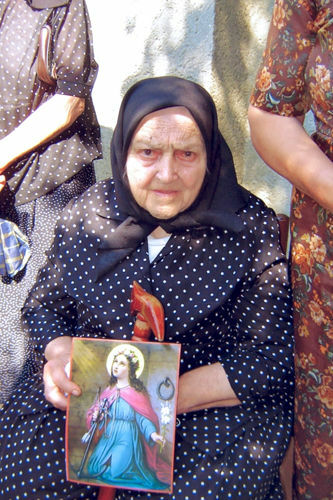 This is a fruit of the spreading of the St. Philomena devotion. The little baby was dressed with some beautiful clothes from Ruth, another ULRA member. Thank you dear Ruth. 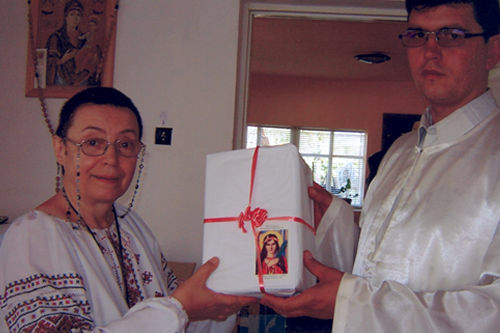 A special present was sent to Father Ioan Puie by our ULRA sisters Regina and Silvia from the U.S.A. Thank you Regina. Thank you Silvia. The day the new ULRA groups were registered. Thank you Saint Philomena for this special present for Romania. Father Ioan Puie was very happy for this special event. He was happy also to get so many presents from the ULRA. 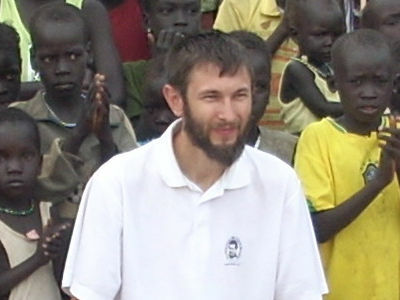 Father Ioan was promoting the Saint Philomena devotion to everybody he meets in his way in his little village. 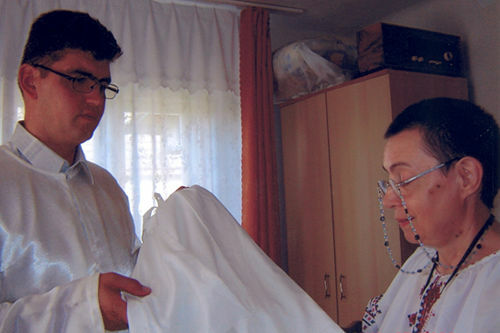 Father Ioan Puie receiving priest clothes also. He is extremely happy for this present. Thank you very much dear ULRA. 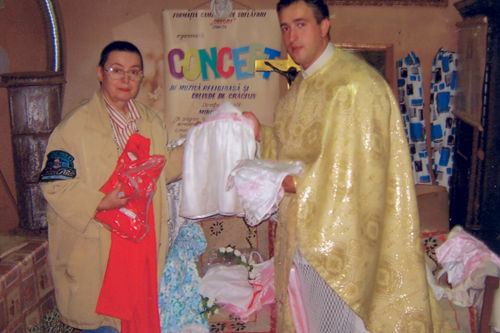 Father Puie Ioan receiving some beautiful little dress for little girls. Thank you dear Patti for this wonderful dress. I will welcome our Bishop dressed like this when we have a celebration anniversary festivity. God reward you! 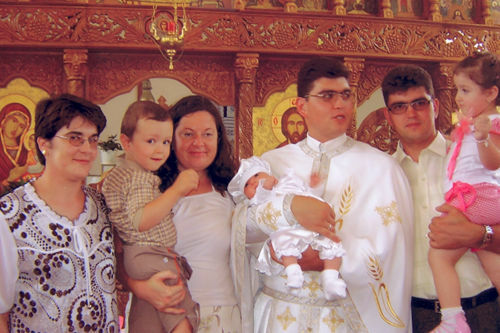 Father Ioan receiving also priest clothes – extremely welcome in villages. As every apostle, Monica also profited by situation and delivered ULRA material to all who ask. 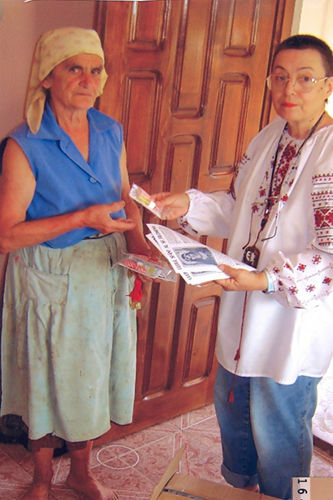 This simple woman donated 10 eggs to help our mission. I and family were very shocked to hear of the Ike cyclone that hit your area. All of us were very very sorry to hear the news. Last night after we heard the news, we right away entered our prayers room and prayed for you and your family, your mom, you’re staffs, all benefactors, The Slater's, and all ULRA members in your area, and those who are living in the disaster area. We keep on praying for all of you and hope that all of you are safe and haven't been hurt of suffered any damage. We pray and hope that your house and the Philomena Missionary Center will not be destroyed by the worst cyclone. We also hope that all you loved ones are well. After praying for you, I tried and tried to send you the e-mail news but unfortunately it failed. I think the connection was probably temporarily unavailable or something mechanical error. So now I am here at the internet cafe to write you and hope that you'll get the news. Today is Sunday here and we will write your names and the intention for your safety and put it on the Holy Altar to be prayed by the priest and also by the people who attend the Holy Mass which will be scheduled this afternoon at the Cathedral. I also have tried all I can to contact some members of Living Rosary to pray for all of you. May God protect you, and Our Blessed Virgin Mary and our loving Saint Philomena, The Angels and all Saints be with all of you. All of us here would be grateful if you are able to inform us how all of you are now. Dearest Patti, I and family would like to thank you heartily for your prayers that I am still alive. But I still have to be very careful as it is still very painful when I walk or when I sneeze or cough. I hope I wouldn’t have the second operation for this. This pain made me unable to write you sooner as I expected after I checked out from the hospital. Consuming medicines might have caused some side effects to my health. But now it seems much better and for me this cure was a miracle one. I keep on using Holy Oil, wearing Cord and I thank to our Blessed Virgin Mary and Saint Philomena for their intercession that I am still alive at the moment. I also would like to let you know that the boxes (three) boxes of sacramentals and a letter sent from you have arrived me safely. Thank you very much for few Angus Dei and other sacramentals for the people here. They have been well distributed to the members awaited for them. 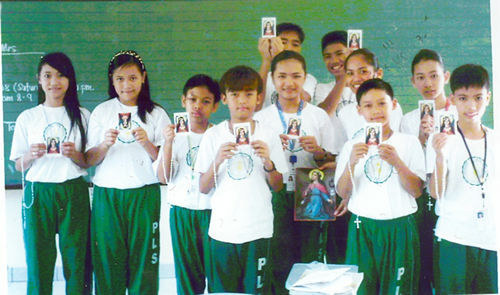 They were very happy to have the sacramentals and they told me that they were very happy to recite their Decades daily. I keep on spreading Living Rosary, I often got the phones from those who wanted to ask information about Living Rosary, and some came to see me at my home. My sons and my wife helped me a lot in spreading. Being stronger and stronger I plan to see some schools to introduce Living Rosary to the students and the teachers there. At the moment I have enrolled many new members and I will send the names to you very soon. If possible I will send them to you after the Holy Mass. Now I have to go back to my home to prepare my self to attend the Holy Mass. I will do it on my way home after Holy Mass at the Cathedral. 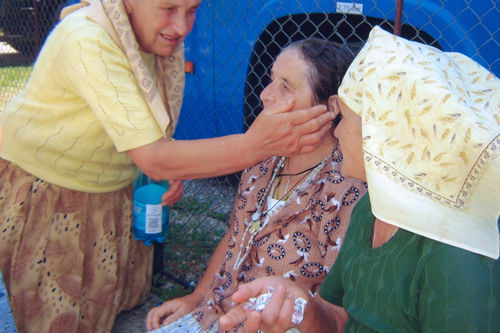 I will write and tell you more about a lady whom miraculously healed from his bad disease. I think that is all for now, and our heart and prayers are with you and family, with all of your Staffs, with all benefactors, and with The Slater’s. Our very best wishes to all of you from me and family. The love and peace of our lord Jesus Christ be with you and with the entire living Rosary group. How are you? I hope you are doing great for the sake of our loving Father. I came back to Jerusalem after long summer activity in Ethiopia specially I have been in the poor Christian area. 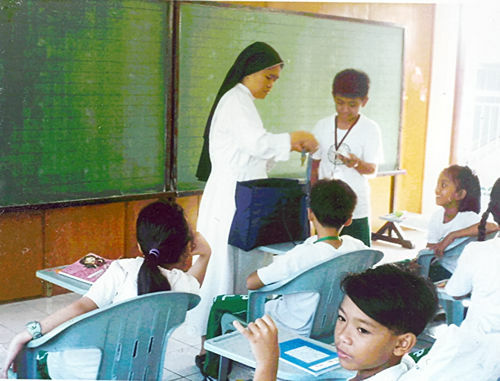 It was my great joy to be there and to teach them about our heavenly Mother Mary and for our patron St. Filomena. 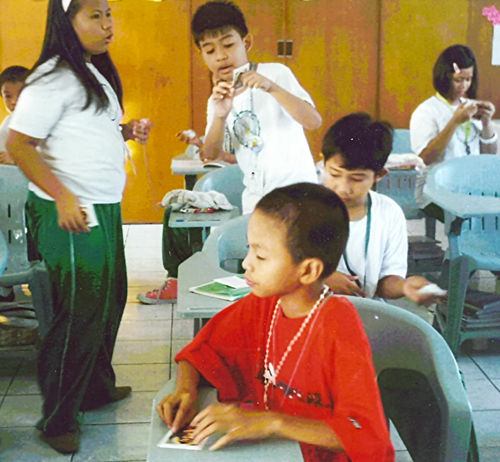 After teaching them I gave for all young people and children the Rosary and Medal which you send me last time they where very grateful for you and for all those whom support you in different way to reach them. Dearest Patti, Whenever I kiss the altar for the celebration of Mass I remember you. 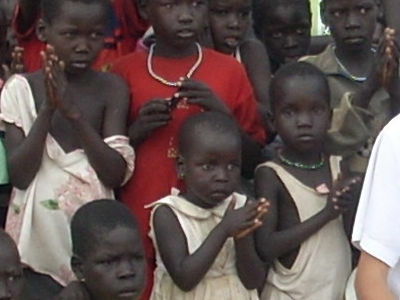 Just I sent you some photographs of the children. No doubt you are overwhelmed with mail and the need to respond to everyone - sounds like a humanly impossible task. Your booklet, Dedicated Decades, was, for me, a wake-up call that there are so many others out there in this big world who are suffering and yet manage to keep the faith. Thank you for your work, thank you for your effort, thank you for doing that which others should, but don't do. I will remember you and your staff in my prayers - and will continue to send donations for the simple reason that they're needed and not necessarily for an answered prayer. I mentioned in my note to you that St. Philomena had stepped up to the plate and hit one out of the ball park ... you, undoubtedly, do that every time a new issue of Dedicated Decades arrives in my mailbox. Continued success to you and your staff. Good afternoon! I wanted to give you an update on the generous shipment of religious materials, Rosaries and Scapulars. We have 70% of what you sent in one box. We are waiting on the shippers to come and to pick it up. We are sending it by private company Medrano. 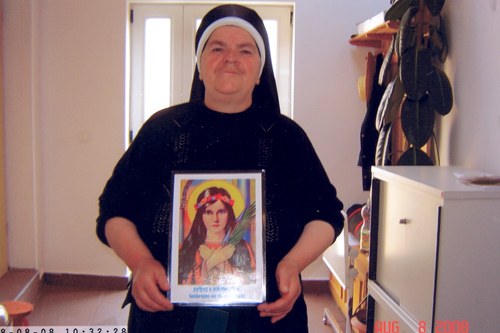 Sister Laura is raising funds now for the shipment. She just began the school year and was quite busy at the end of August. 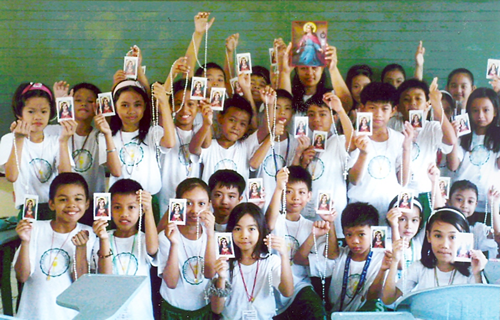 We are really blessed to have your help and the help of St. Philomena! And I just want you to know that we are grateful. As Sister Laura has time, she will be packing a second box with the remainder of the materials and we will be getting that off. I helped with the first box, but am now on my regular job, which is a ship doctor - I am writing from the ship - we are in St. Petersburg, Russia, now. May our gracious Lord and Lady bless you - may the lay apostolate be blessed - I bless you for bringing me the devotion of St. Philomena and for all that you do. I promise to live "OUR COMMITMENTS" (The decade, intention, hour, duration, spread the devotion, one decade for each member, and to pray for one another) for the greater glory o God and for the salvation of souls. May the Lord will continue to bless the association and all the members with His love and mercy. Sr. Eljisa prepares the membership cards for the pupils of the Pledge of Love School and welcomes them into the ULRA Family. The Local Superior of the Daughters of Charity of the Most Precious Blood gladly acknowledges the Sacramentals from the Universal Living Rosary Association of Saint Philomena. The pupils of Grades III, IV and V cheerfully raise the holy Sacramentals as they welcome the Living Rosary in their hearts. My mission was wonderful! You will see how people are thirsty for the decade of the Rosary and God! They lined up for registrations, to become a new member of the Living Rosary Association! The priest was so happy that he left the masses to me! And I used their native language in saying masses as I have the gift of languages, I got them! Mum you know there is a need to rekindle the spirit again on the members! After the crises here in Kenya, many problems, and the priests are ignorant of the devotions, they need somebody to explain to them what the devotion is all about IN PERSON! Thanks to God the new Cardinal John was appointed as the head of pontifical mission for the propagation of faith! There we are!!! 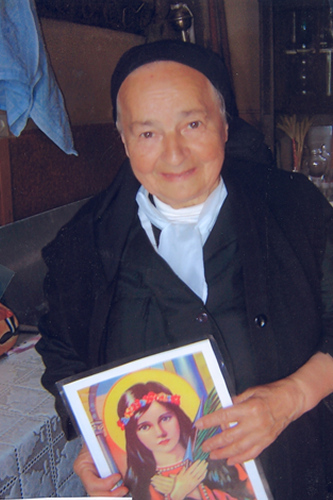 Venerable Pauline Jaricot is everywhere in Kenya, the Photos, the pontifical childhood mission, all with the life of Venerable Pauline Jaricot with seminars for priests, so many priests in Kenya are coming to know more about Pauline Jaricot and all that he had done! It is a divine providence! Now mum I have many invitations!!! And I am almost free now! So I want to visit all the places and respond to the priests’ invitations and as of now about five priests have invited me! You are trying mum bravo! Keep up the spirit! I will post about 5,000 names this week! -in next message I will talk about the duties of a superior! Since January 2008, we have been hearing of Satanism in this area of Bizana. People from the Roman Catholic Mission have been reporting to us that there are some people who go around hunting for women and girls whom they can kill and remove some parts of their body viz. breasts, uterus, etc. Seemingly, they give these things to people who promise them a lot of money. We were told that these people are able to open the locked doors of houses by simply twisting their index and middle fingers and when the door falls down, they are able to get inside the house. People say that this was happening between 7 p.m. and 8 p.m. when the family members were just relaxing, having their supper or watching TV. It is said that when they get into the house like that, people try to run away to save their lives. Some would hide under the beds or somewhere inside the house if they cannot manage to get out of the house. The eye witnesses have reported that, when the culprits get hold of a woman, they knock her on the head with a hammer and she gets dizzy and falls down semi-conscious. The culprits then draw out some blood from the jugular vein in the neck with a big syringe and fill 1 liter or 2 liter containers with the fresh blood while the victim is still alive. After that they knock the shoulders of the victim with a hammer again, so that the victim cannot lift her arms while they are removing her breasts. The culprits then cut out the uterus and other private parts and leave the victim to die, as they make their way out. During the Holy Week, it was reported that, at least, 19 people had been killed. To our greatest surprise, none of our Catholics in that area of Luhrolweni near Port Edward was attacked and killed. 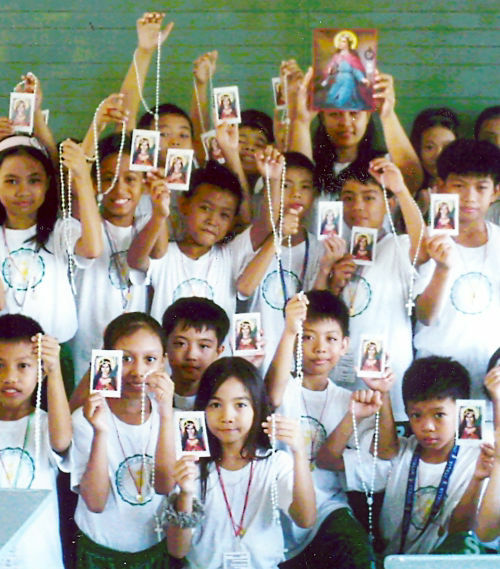 They all believe that it is because they were wearing the Sacramentals: the Rosary, Mm and St. Philomena/St. Michael medal. 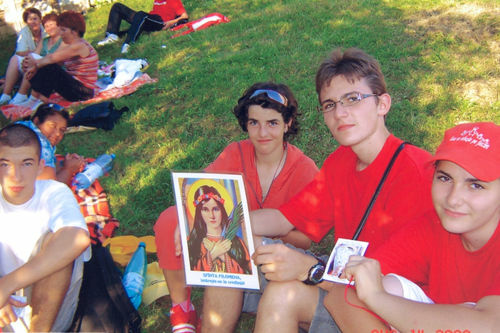 They tell us that the blessed oil of St. Philomena is so powerful. They bless themselves with it, anoint their family members and smear it on their doors. Anyone who seems to be possessed by the evil spirit becomes well again after being anointed with this precious oil. 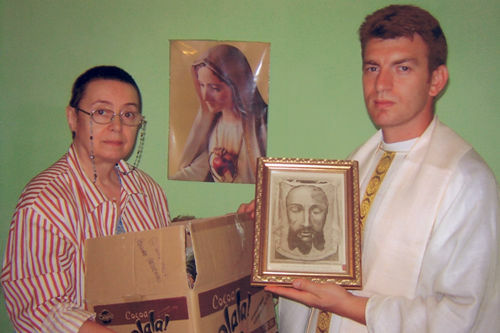 Even non-Catholics do come to the convent to ask for Medals and holy pictures saying they believe that they evade the devil. Our sincere thanks goes to our Blessed Mother Mary, St. Philomena, St. Michael and all the promoters of the Living Rosary. Prayers and Sacramentals have driven away the evil spirits. May God bless and reward you all! News from Thailand from December 2007 to present.